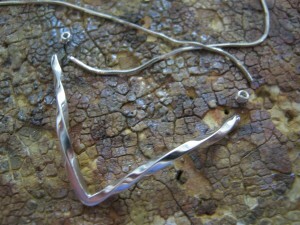 The request: “The chain comes straight down on each side, then goes together in a V shape. Oh, and a cobalt blue stone”. No problem, if I can find the right stone. I start mentally running through my collection of rough. Nope, no cobalt blue there. Thankfully, a local lapidary and jewelry supply store, Arrowhead Supply is one hour away. Soon, I’m on an adventure to Arrowhead. Upon arrival, I am instantly sidetracked by boxes of new rocks. Okay, the rocks are actually old of course , but they just arrived in the store. Sugilite, jade, various fossils, azurite/malachite, dino bone, mystery agates, oh my! I lose all other thoughts as I admire these, turning them over in my hands and wondering in amazement at the treasures of this earth. Beautiful! Back to reality, unfortunately, I can’t buy them all, so— what was today’s mission again? 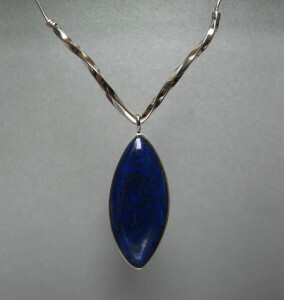 Oh yes, cobalt blue. 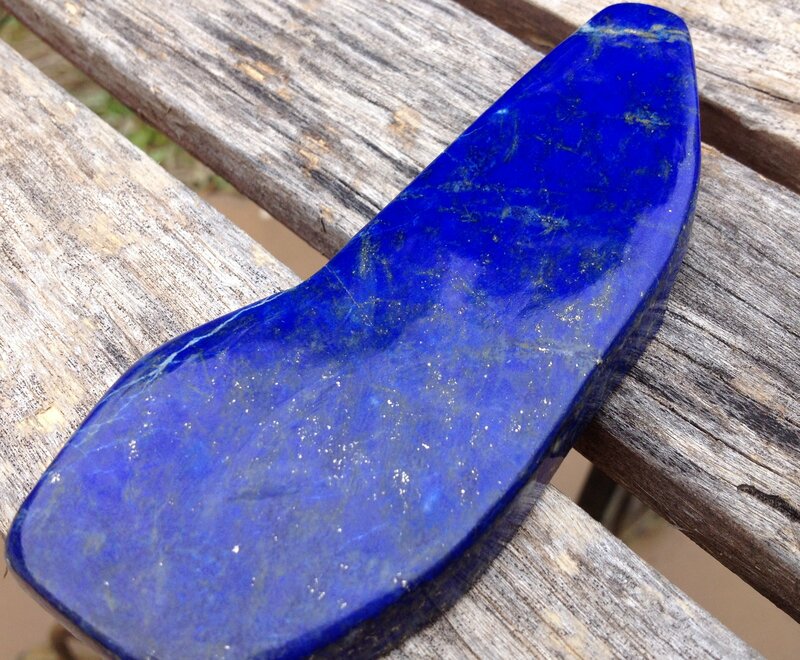 Thanks to my friends, Kathy and Mario, hardworking rock shop owners, I’m soon holding in my hands a gorgeous piece of Lapis Lazuli with a vein of the elusive cobalt blue. 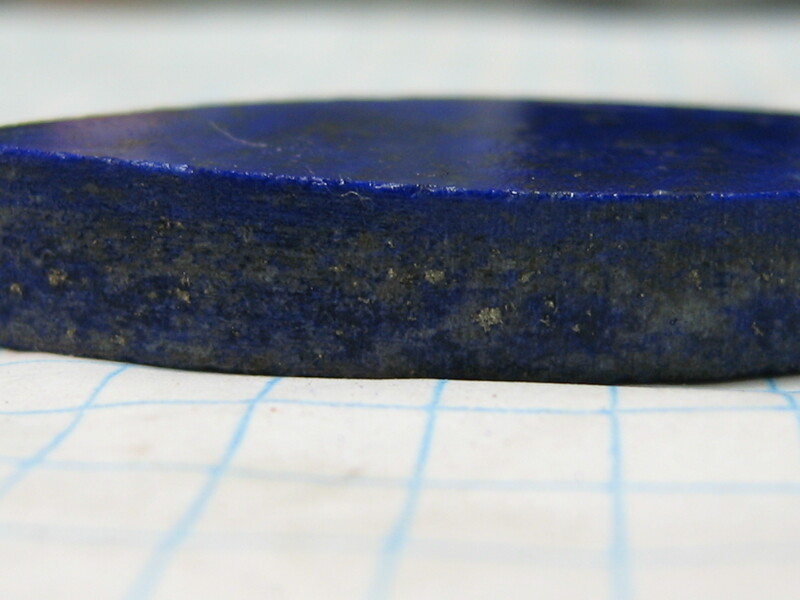 Someone, no knowing who, where, or how long ago, has already discovered the bright layer of color in this rough, natural stone, and displayed it by cutting just above it, grinding just to it, then polishing its surface. Wow, beautiful! Countless hours can be spent online shopping for stones, but when it really has to be just the right color, nothing beats buying in person. Besides the fact that a photo of a stone rarely represents its true beauty, it’s just more fun buying in person when you do find just the right stone. 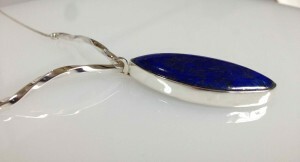 Many things are more efficiently bought online, but not one of a kind natural stones. If you’re lucky enough to have a local rock shop, remember to support it! Now I’ve got my stone, so, on with the custom pendant request. 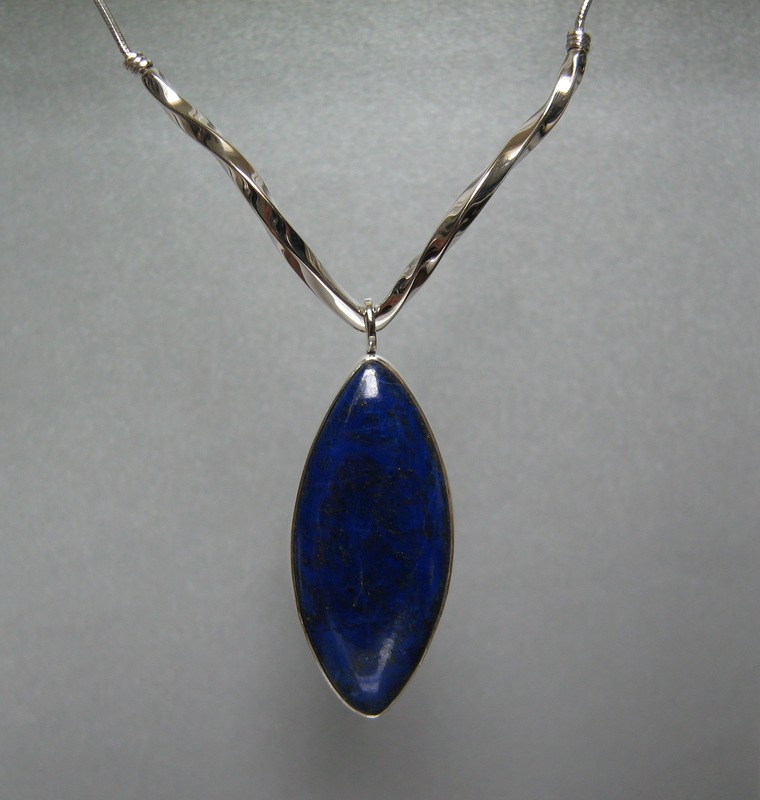 At 5″ long, 2″ wide and 1/2″ thick, this Lapis is a little too chunky for even the chunkiest of pendants! My trusty Highland Park saw has no trouble slicing the thick slab into two thinner slabs, then some smaller shapes for cabbing. There are plenty of beautiful blues in this stone, with flecks of gold colored pyrite, but the cobalt blue color is what we’re after today. 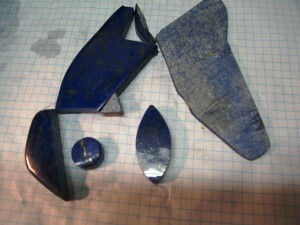 I choose carefully for the best color in my cabochon. Cutting up a perfectly nice rock always gets my adrenaline pumping. 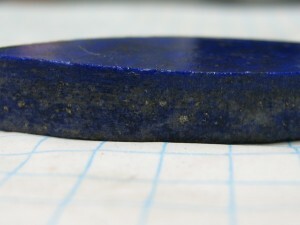 The cobalt color layer is only a few millimeters thick, so the finished stone will have to be more flat on the top. 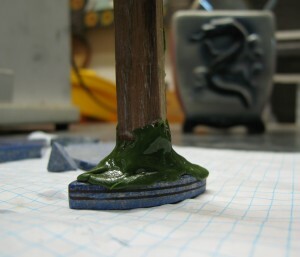 If I start rounding it down, I’ll grind off too much of the desired color. Cab is finished, time to begin the silver work. 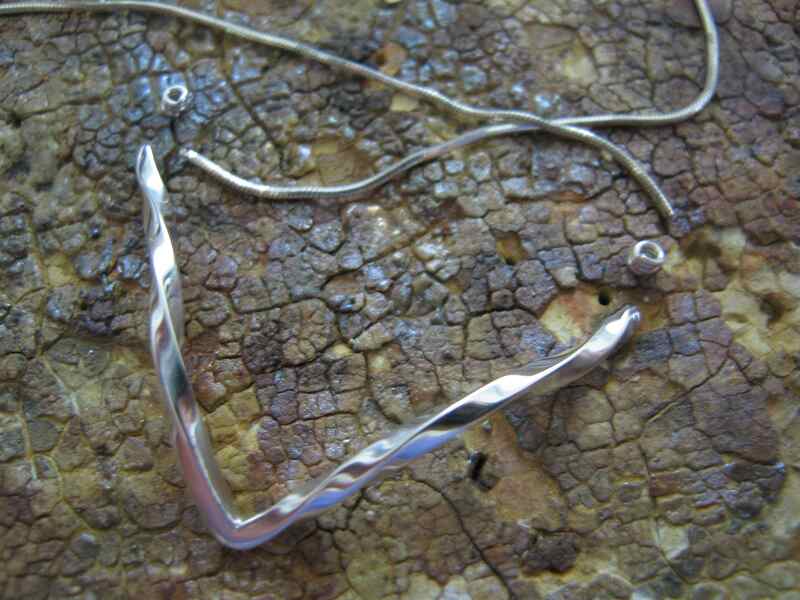 I made a partial cut in a square sterling wire, filed it with a triangle file, bent it to a right angle, soldered the angle, then twisted and shaped the two “arms” coming up from the “V”. The tops of the arms have a hole drilled for inserting the cut commercial snake chain. 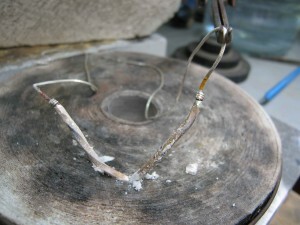 The chain is soldered inside the twisted wire arms first, then the spirals are slid down and soldered to the arms and to the chain. 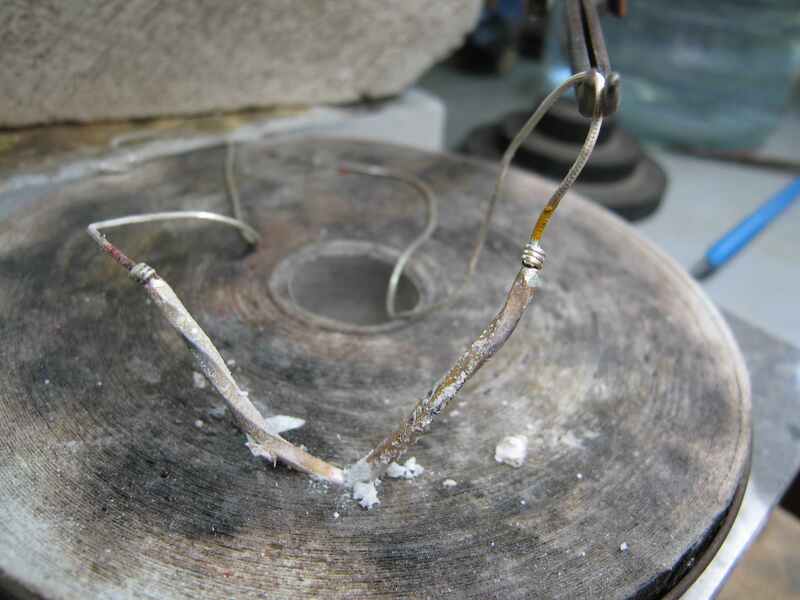 Another adrenaline rush, soldering without melting the chain! Yellow ochre kept the solder from flowing up the chain. I like to let the back of the stone show too! 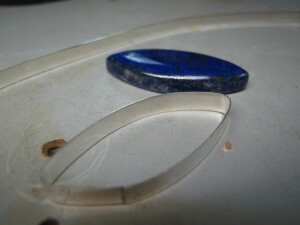 I make jewelry, mostly silver with cabochons. I also do lapidary work. I enjoy taking the time to do my best on everything I make. Thank you, I’m glad you found the soldering info useful. Your article was very helpful! Especially the soldering info. The results of your project were perfection! 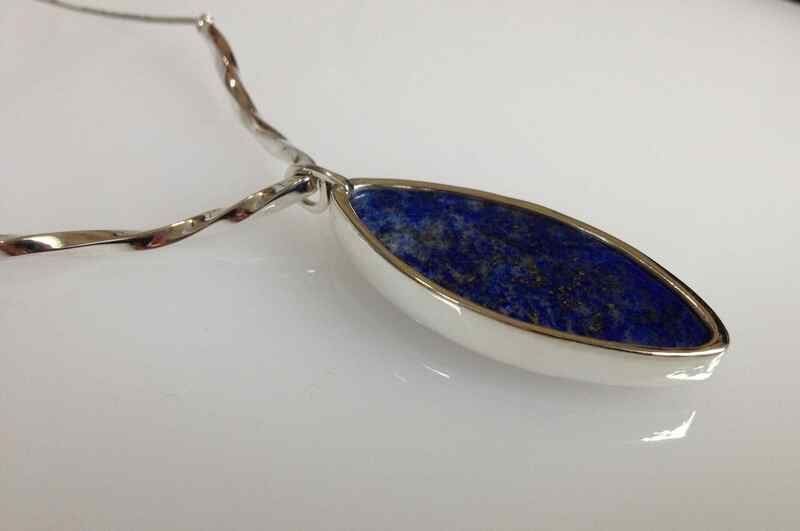 Previous post: Politically Themed Jewelry??? The Spiritual Show, I’ve been accepted!